We have just returned from visiting the Swanland Village School Nairobi, Esther's School Ngong & CEPACET our partner organisation in Nairobi . In our group this year we had Richard Swain, Rob Byass, Shirley & John Waters. Many thanks to people who donated items for us to take - we managed to take a quarter of a tonne for both of the schools. The children & teachers were so appreciative of everything we managed to take. The progress at Swanland Village School has been amazing now that it is under the control of Chryspin & Flouridah from CEPACET. The standards have been raised since our visit last year and everything is so much better organised. The teaching Team are all qualified, work together as a Team and all really enjoy their work. They are all very hard working and enthusiastic. The standard of teaching is much better with all children engaged. We were all impressed at the standard of work, behaviour and spelling. Teacher Dan (ex Swanland pupil) was appointed Deputy Head but is acting head Teacher for this year. This is a difficult job for him as he has no experience of other schools and he is leading some very strong teachers. Jeanne (is French and worshipped at St Barnabas last year) has settled down well at the school and loves every minute of it. She has taken on the roles of Matron (Matron Rita has just had a baby and will be back in September) and teacher in class 4. Her first aid skills have been so useful. Last week she had to deal with 2 children with Malaria, one with Rabies & one with a head injury. She spent many hours with Chryspin taking children to the dispensary & hospital. Health care is a big problem at the school because parents send their children to school even when they are unwell. Some of the parents do not take any responsibility for their children's health and cannot even be bothered to take their children to the hospital even if we pay. The 158 children at the school are so happy they do not want to go home. On our last day the school broke up early for mid term break, the children were still there 2 hours after they should have gone home. Some of the children arrive at school at 6 am every day. There are no boarders at the school although we have been asked if we can set up a rescue centre for children in desperate need. There are 2 members of staff who live on site who supervise the children when they arrive. The school is so popular that over 600 children applied for places and there is now a waiting list of over 300children. It was great to give out all the new equipment & uniforms. The children & staff were amazed and couldn't wait to try everything. We had a great time with the parachute. The children looked so smart when we handed out 300 pieces of uniform. We took a whole reading scheme (333 books) , sports equipment, footballs, pumps, football kits underwear, (enough for all the children to have a new pair of socks & pants). A big thank you to everyone who donated anything . One of the highlights was to meet the village Chief who warmly welcomed us. This lady was not a tribal chief but the equivalent of the head of local council ( university educated and Westernised). She was in charge of local police - she was definitely in charge of her slum! She said Swanland is the best school in her slum and she wanted to support us in every way she could. She commented on how well CEPACET managed the school. We were pleased to see the new land we have rented next to the school. This will be great for the children to play on and will give us room to expand a little. We did not see the fence come down as it did not become ours until 1st July - the day we came home. It was still being used by local joiners & tradesmen. Unfortunately it is not a very level site and work is needed on drainage and fencing. The lady who has been renting it until now owns the fence and gate so she is taking them with her! Due to the increase in numbers the toilet facilities are not adequate. The landlord has agreed we can move the fence and gain a little land from behind the toilets so we can extend but this will not be easy as this land is being used as a rubbish tip at the moment. We may move the kitchen out of the classroom area and re-site it on the new land. This would mean it would give us more classrooms and would be safer in case of fire. We are applying for a grant to help us with this. It was good to see CEPACET offices and other projects they are involved with. We visited their offices in the town centre which were on 11th floor of a rather shabby office block built in the 60's. We also met Jared another Director of CEPACET. We were all very impressed at the sort of work they are involved with. The children enjoyed a visit to The Nairobi Animal Orphanage. This was the first time many of them have been on a bus or seen wild animals. We took 80 children who looked very smart in their new uniforms from UK - I think it was only their shoes that gave it away that we were a slum school! They enjoyed every minute of it and were so well behaved. We had the privilege in visiting the homes of some of the children. It was very sad to see the conditions that these children had to live in. They were the usual 10ft x 12ft shacks divided down the middle with a curtain. 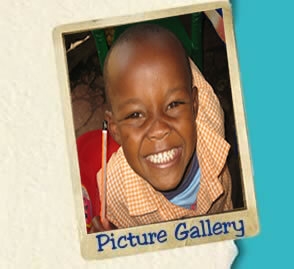 Many of the children are orphaned and live with their grand parents. Due to the high demand for places we need to improve the toilet and kitchen facilities. We need to address the drainage of the whole site as the classrooms tend to flood in the rainy season. Water supply is unreliable and we also like to install electricity. Next year we need to introduce another class so class four can go to class five. We visited the Brosis School with Chryspin & Flouridah. This is the school that had previously been on our site before they had to leave because they could not afford the rent. A typical slum school not very well resourced. The children wear the same colour as Little Weighton School so I gave them a few uniforms. We visited another school in the Majengo slum on the other side of town. The school was run by a lovely lady called Grace who did what she could for the children on very little funding. The building was very dark, cramped and in very bad repair. There is no feeding programme and the children did not have a safe place to play. These were some of the worst conditions I have ever seen. There was sewage and rubbish everywhere. Chryspin has bought a very small piece of land for her to build new 2 storey school. For this visit we were joined by a group of 10 Australians on a University study tour. They were shocked at the conditions they witnessed in the school & the slum and some even broke down in tears. Later that day they visited SVS and could not believe what could be achieved. They didn't want to leave - they saw the children singing & dancing and said they wanted to stay all day. We spent a lovely afternoon being entertained by the children at Esther's School Ngong. The singing, dancing drumming was fantastic and we had great fun as we were invited to join in. As usual everything was so well organised. Esther now has a Scout troop at the school who looked very smart in their uniforms. We officially opened the new building with the 6 classrooms. Everything is well built and very smart. We gave out the sports equipment, pants, socks, jumpers etc. It was really a very special time. We spent another amazing day with Esther & Daniel giving out 82 mattresses. The women have to save about a quarter of the cost of the mattresses and Esther uses the money from the bead sales to top it up. She gave out 82 mattresses at Easter (round1) and we were giving out the mattresses on round 2. Esther encourages the women to save and contribute. Only the ladies who are bed ridden were given a free mattress. It was great to see evidence of the other project we have been involved with. Esther has a project each year to help the women she cares for. The families in her project now have water tanks, goats (some as many as 5 now) chickens, cooking pans etc. As always we are amazed at what Esther & Daniel manage to achieve with the few resources they are given. As usual we have come home with bags full of jewellery to sell to you all. Thankfully there are some different items - hope to have a sale soon. As the school expands the toilets and kitchen need upgrading and extending. Esther has asked us if we can provide a Head teacher so that she can be released to manage the whole project. This year the traffic was unbelievable. Over the years we have visited the traffic has progressively worsened but this year there are road works & traffic jams everywhere. Every roundabout took about 10 minutes to negotiate and some days we were sat in traffic for 5 hours. Hopefully when the new roads are finished travelling will be easier. The roads in the rural areas are in a terrible state. They are the worst we have ever seen. At one point we had to get out and walk to visit the homes of the ladies. We had a great week & were hugely impressed by both the projects. 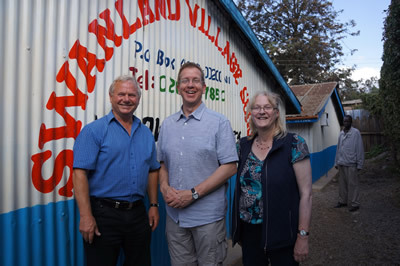 It is lovely working with Esther & Daniel, Chryspin & Flouridah who all have a heart for the poor of Kenya . Thank you to everyone who has supported the projects in any way. We have so many pictures of our trip we are hoping to have an update evening to share with you all soon. 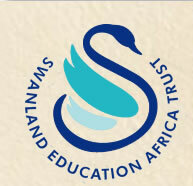 Swanland Education Africa Trust is a UK Registered Charity, No.1140208.